Having a positive mentor is important in the development of a child. Someone who they can talk to; someone who can help guide them through the challenges of adolescence. For children surrounded by negativity, a mentor can change their lives. 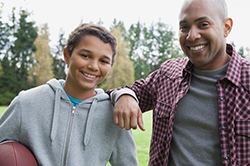 At Mercy Home for Boys & Girls, connecting youth with mentors is a crucial part of our mission. For more than 30 years, our Friends First program has matched youth in Chicago with adults seeking to make a difference. As we celebrate National Mentoring Month, we are grateful for the dedication of those in the community who help us create brighter futures. This past year, we began the second edition of our Friends First Workplace-Based program. Through this program, employees of local businesses serve as mentors for children throughout the school year. Our longtime friends at TransUnion served as mentors for a group of children last year, and this year they are joined by a group of employees from AT&T Illinois as well. Both organizations have provided vital support to our young people over the years, from providing financial literacy education, providing generous grants in support of our education and athletic programs, and more. Through our Workplace-Based program, they are able to have an even greater impact on our young people. In the fall, 21 girls between 4th and 8th grade from St. Malachy School were matched with mentors in the Workplace program. Every other week, the girls visit the corporate location of either TransUnion or AT&T to spend time with their mentors. The experience exposes mentees to a workplace environment and provides an opportunity to have one-on-time and build a relationship with professional women. Some of the activities mentees have enjoyed with their mentors this year include creating vision boards for self-love, creating their own handshakes and assembling care packages for veterans at Christmastime. The program focuses on teaching leadership, empowerment and skill development in decision making for mentees. Yet the benefits of this program are felt by the mentors as well. Both TransUnion and AT&T have been longtime supporters of Mercy Home, and we are so thankful they have deepened their commitment by becoming mentors. The impact these mentors have on children will be felt for the rest of their lives. Some effects, however, can be more immediate. Between 2014 and 2018, 80 percent of mentees surveyed in Friends First reported an improvement in self-esteem following their mentoring experience. Eighty-six percent of mentees surveyed reported an improved ability to stay on task with their schoolwork. If you would like to become a mentor, or for more information about Friends First programs, please contact Tilisha Harrison at [email protected]. For information about the Workplace Mentoring program, please contact Victor Nieto at [email protected].